The Department of History is pleased to offer several scholarships for undergraduate students in our program. These annual awards are open to History majors who have a minimum GPA of --- and have completed -- hours of college credit. Scholarships usually range from $500-$1500. The application process includes submitting a scholarship application, a letter of recommendation, and a personal statement. For instructions on accessing the online scholarship application as well as a valuable guide to additional funding sources, see the UNCW financial aid page or check in with the history department front office. For: undergraduate majors who show particular promise in history, maintain a strong GPA, and have certified "financial need." For: undergraduate majors with a strong GPA and a demonstrated interest in global history and experiences. If you are an Honors College student, you are eligible for several other scholarships. Information on these awards is available at the UNCW Honors College page. In addition, the department's annual Spring Festival of Undergraduate Research awards prizes to the three best research displays, and the department nominates strong students for special awards from the bookstore. The history department has a chapter of the Phi Apha Theta National History Honor Society. 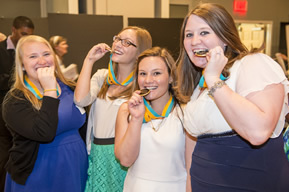 For more information, and to see if you qualify to be inducted into the UNCW chapter, see our Phi Alpha Theta honors page. As a history student, you might want to pursue research at a library, archive, or historic site outside of Wilmington; or, you may have the opportunity to present your research at a professional meeting or conference off campus. The History Department encourages and supports undergraduate research by offering financial support in addition to intellectual guidance. For example, every year the Department sponsors a mentored research trip for advanced undergraduate and graduate students to the National Archives and other Washington, D.C. repositories. Students may also apply for travel grants for research purposes, thanks to the support of the Martha J. Clayton and Neal/McCaffray Funds. Watch for e-mail alerts from the department about these opportunities or contact your advisor for more information. UNCW's Center for the Support of Undergraduate Research and Fellowships (better known by the acronym CSURF) also offers travel awards to fund student research and conference presentations. You can find more information on eligibility and the application process here.